In this week’s episode, Robert and I announce that CMI has launched Content Inc., our new platform focused on the needs of entrepreneurs, business owners, and start-ups. Next, we dig into Mary Meeker’s annual technology trends report, which is full of amazing facts and opportunities; we touch on developments in mobile, enterprise software, and millennials’ growing influence. After a discussion of how start-ups can use content marketing, we explain how brands should respond to Google’s new “Phantom” update, and why claims about advertising automation technology are highly overrated. Raves include a savvy job seeker who used engaging content to land her dream gig and the strategy Traveler’s Insurance is using to grow a killer content team. We wrap up the show with this week’s #ThisOldMarketing example from Band-Aid. CMI launches Content Inc. (4:02): I’m very excited to announce that CMI launched the Content Inc. website this week. It carries the name of my new book, which will be officially launched at Content Marketing World in September. It describes a six-step process entrepreneurs, small businesses and start-ups can use to create a competitive advantage. The idea behind Content Inc. is that in order to build a truly successful business, entrepreneurs and start-ups should first focus on building an audience through content and then launch their product to an engaged audience that’s ready to buy. Mary Meeker’s 2015 Internet Trends (7:48): Mary Meeker’s yearly Internet Trends report, the ultimate compilation of essential tech statistics, was released last week, according to TechCrunch. This 196-page report is full of important trends and opportunities. Big takeaways for me include the steady disappearance of the desktop and the explosion of user-generated content. Robert’s big takeaways: The continuing explosion of mobile, Meeker’s prediction that 3 billion more people will be online in the next five years, and the reinvention of enterprise software. In addition, 46% of B2B decision-makers are now millennials. Check it out for an abundance of ideas and opportunities. What start-ups need to know about content marketing (20:22): What do entrepreneurs need to know about content marketing? It’s like diet or exercise – it’s a long-term game. In addition, you can begin writing about your vision and what you’re building even before you have a shippable product, and build passionate prospects in the process. That’s the advice of Sunil Rajaraman, CEO of Scripted, interviewed on the FounderDating blog. Robert and I both love this business model, which emphasizes creating an audience first and then looking for ways to monetize it later. We also agree that learning how to write well is more important than ever! Changing how quality is assessed results in ranking shakeup (27:09): Search Engine Land recently confirmed with Google that it has made a change to its search algorithm to improve the quality of its search results. Google isn’t saying what criteria it’s using to assess site quality, leading many pundits to call this the “Phantom Update.” Robert and I agree that this is further proof that brands need to focus on good quality content focused on a specific audience — not quantity of content. 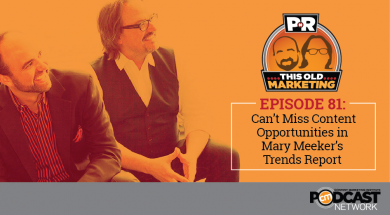 How automation will change content native ads (33:50): Content marketing and native advertising will see strong gains in the near future, thanks to increasing adoption of advertising automation technology by marketers, according to a new report from PulsePoint and Digiday. It predicts that hurdles involving efficiency, measurement, and targeting will be resolved by the rise of automation technology. Robert and I aren’t so sure about that. Robert’s rave: Robert is seeing a growing number of examples of savvy job seekers using content marketing to advance their careers. A case in point: Shelby Mitchusson wanted to land her dream job doing sign language for Austin City Limits. She got the gig by creating a captivating sign language performance of Eminem’s song, Lose Yourself. It went viral, and now has over 3 million views on YouTube. Joe’s rave: I was at a Business Marketing Association meeting last week where John Bell, VP of Enterprise Digital at Travelers Insurance, gave a presentation on building an editorial organization within your corporate culture. He is now growing his staff by hiring editors and journalists from publishing companies, helping to embed storytelling and journalistic principles into his team. This is a very smart approach that you’re going to see more of in the near future. Band-Aid: In the early part of the 20th century, wounds were dressed with rolled cotton bandages and adhesive, which were cumbersome and not very effective. Earl Dixon, a cotton buyer for Johnson & Johnson, invented the idea of segmented bandages that incorporated cotton and adhesive tape in a simple, clever design. But when Band-Aids were launched in 1920, they flopped because consumers did not know what they were or how to use them. So J&J refocused its marketing on customer education. 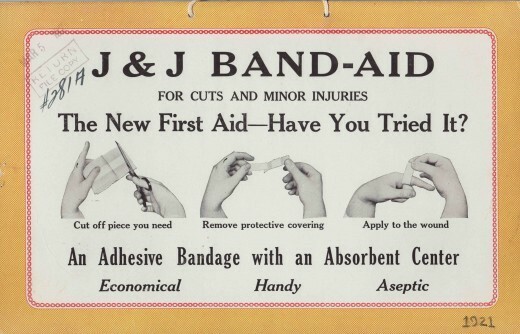 First, it distributed Band-Aids for free to families and mothers as part of J&J First Aid kits, which contained a variety of products for treating wounds, plus books and instructions. Next, J&J extended its giveaways to vertical markets, such as railroads, the Boy Scouts of America, and the American military during World War II. In addition, J&J educated doctors with a book entitled Professional Medical Uses of Adhesive Tape. 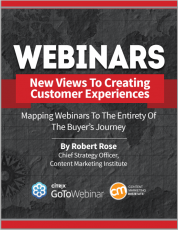 Thanks to these extensive customer education efforts, sales exploded. Over 6 billion Band-Aid strips were produced by J&J in 2014, and they are now used in one out of every seven American homes. Band-Aids are an awesome example of #ThisOldMarketing.